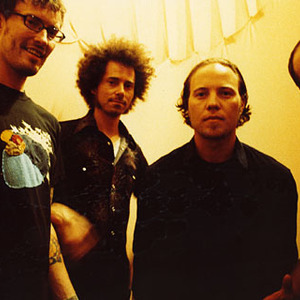 Rogue Wave is an alternative rock band from Oakland, California, formed in 2002. They are headed by Zach Schwartz (aka Zach Rogue), who created the band after losing his job in the dot-com bust. Their first album was Out of the Shadow which was written, recorded and produced entirely by Zach Rogue (except the drums) - released privately in 2003 and finally re-released in 2004 on Subpop. In the autumn of 2004 they went on a national tour of the US, which lasted two years. They have been compared in the music press to The Shins. Their second album, Descended Like Vultures, was released in October of 2005. They are currently signed to Jack Johnson's label Brushfire Records having released 2 previous albums on Sub Pop). They are also featured on the Stubbs: The Zombie Soundtrack doing a cover of Buddy Holly's "Everyday". A live version of their Out of the Shadow track, "Every Moment", appeared on the soundtrack for the movie Napoleon Dynamite. However, the song never appeared in the movie itself. In addition, the song "Eyes" was featured twice in the Ryan Reynolds movie Just Friends this fall, and the first episode of NBC's Heroes. The Fox show The O.C. has used Rogue Wave songs, "Publish My Love" (DLV) and "Interruptions" (10:1 EP) as well as included "Publish My Love" on The O.C. Mix 5, a collection of songs used in the show. Rogue Wave recently recorded an exclusive song for the new movie, "Spiderman 3". Until very recently, the band lineup consisted of Zach Rogue (Vocals, Guitar), Pat Spurgeon (Drums, Samples, Guitar, Vocals), Gram LeBron (Keyboards, Guitar, Drums, Vocals) and Evan Farrell (Bass, Vocals). Farrell replaced original bassist Sonya Westcott in Autumn of 2004. Unfortunately, in December 2007, bassist Farrell passed away in a house fire. A link to the memorial paypal fund set up to help support the Farrell family can be found on the band's website www.roguewavemusic.com. Their new bassist is Patrick Abernethy. Zach Rogue was previously a guitarist in the Bay Area band The Desoto Reds. Pat Spurgeon has played with bands Antenna, Stranded at the Drive In, Ramona The Pest, Brando, Steve Kowalski, and has also released solo work as The Phantom Drummer. Gram LeBron has been involved in the bands: Schrasj, Sad Like Crazy, CoNuNdRuM, Jessica Six, All Transistor and has also released solo work as Golden Gram. Evan Farrell has played with the following bands: Japonize Elephants, Mega Mousse, Amaldecor, Big Mule, Hunted Haunted Bazergahn Klezmorchestra, Grande Rouge, Kentucky Nightmare, and Mama HooHoo. Sonya Westcott was in the band Venus Bleeding prior to her time with Rogue Wave and is currently working on an album with her new project. Most recently, Rogue Wave released Asleep At Heaven's Gate in September of 2007. They are currently wrapping up their US winter tour to start their European tour. They plan to tour the states again in April 2008. Rogue wave is set to release a new LP in March of 2010 named Permalight.